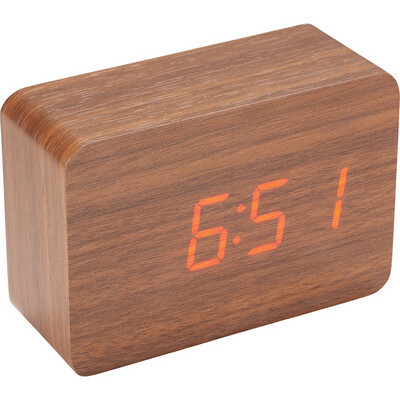 Description: This LED display wooden clock is perfect for any desk, table or night stand. Features: The clock displays the time, calendar, alarm and temperature. You are able to save up to 3 different alarms. Packaging: In a polybag and presented in a black tuck box. Packaging size: 110mm(w) x 80mm(h) x 55mm(d) Colour: Wooden Material: ABS Plastic Product Size: 101mm(w) x 66mm(h) x 38mm(d) Freight details : 60 per carton, 13kgs, 30 x 35 x 36cms; Decoration Type(s): Colour Print / Full Colour Print Decoration Area: 75mm(w) x 30mm(h). Price includes : 1 Colour 1 Position Print. Setup is included.